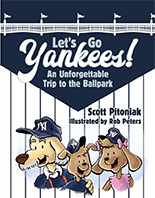 In Let's Go Yankees!, Poppy the Dog takes the subway with his grand-pups, Cammie and Oscar, to Yankee Stadium in the Bronx. It’s the first baseball game for the grand-pups and they discover just how much fun it can be cheering for baseball's most famous team. Poppy has loved the Yankees since his first baseball game when he was just a puppy. He shows Monument Park to his grand-pups and teaches them about the great players who have worn the team's familiar pinstriped uniforms. But little Cammie and Oscar also learn that other Yankee fans — elephants and cats and bears and giraffes and rabbits and robins and camels and even other dogs – are kind and friendly and love the Yankees just like they and Poppy do. All the animals join in clapping hands and chanting "Let's Go, Yankees!" while watching a memorable game (Derek Jeter's 3000th hit!) and on the subway ride to and from Yankee Stadium. This is a heartwarming tale of sharing a love of baseball with the next generation of fans and how a trip to the ballpark can unite those from diverse backgrounds. Scott Pitoniak, best-selling author and nationally honored sports columnist, fell in love with the Yankees as a six-year-old during the summer of 1961 watching Mickey Mantle and Roger Maris chase Babe Ruth's famous home run record. He passed on his love of the Yankees to his son and daughter. Now with, Let's Go Yankees!, Pitoniak shares his love of the legendary team with the next generation and offers lessons about life through the game of baseball. Rob Peter's illustrations capture the spirit and life of Pitoniak's words. Readers can see the happiness in characters' faces and the love of baseball is evident with Poppy and all the baseball fans. Pitoniak includes in the book a timeline and a glossary of the Yankees memorable dates and games, names and nicknames, achievements and quotes. Baseball fans of all ages love to learn the team's history! There have been hundreds of books about the Yankees, but none of them crafts a tale for fans of all generations quite like this one. It also teaches fun facts and history of their favorite team, the New York Yankees. Illustrator Rob Peters is also a cartoonist and designer. He has a degree in Visual Communications from Judson College in Elgin, Ill., and has worked as a cover artist, designer and freelance artist. He has designed logos, book covers and illustrated dozens of children’s books, including Go Cubs Go! Baseball’s Never Give Up Story. He lives with his wife and family in Topeka, Kansas.